As a company incorporated in the PRC and listed on The Stock Exchange of Hong Kong Limited (the "Stock Exchange"), the Company has not only complied with the relevant provisions of the Rules Governing the Listing of Securities on The Stock Exchange of Hong Kong Limited (the "Listing Rules"), but also abided by the PRC Company Law and other applicable laws, regulations and regulatory requirements of Hong Kong and the PRC as fundamental guidelines for the Company's corporate governance. While strictly complying with relevant laws and regulations, the Group is continually striving to further strengthen its internal control and risk management systems in order to improve its corporate governance standards and transparency. The Board is responsible for performing corporate governance duties, including developing and reviewing the Company's policies and practices on corporate governance; reviewing and monitoring the training and continuous professional development of directors and senior management as well as the Company's policies and practices in compliance with legal and regulatory requirements; developing, reviewing and monitoring the code of conduct and compliance manual applicable to employees and directors; and reviewing the Company's compliance with the Corporate Governance Code and disclosure in the Corporate Governance Report. The Company has been recognized by capital market for its sound corporate governance over the years. In 2017, the Company was awarded "The Best of Asia - Icon on Corporate Governance" and "Asian Corporate Director" by Corporate Governance Asia. Moreover, the Company was also awarded the "Platinum Award - Excellence in Environmental, Social and Corporate Governance" by The Asset. The General Meeting is the organ of authority of the Company and exercises its functions and powers in accordance with law. The Board is accountable to the general meeting and is mainly responsible for implementing the resolutions passed in general meetings, reviewing and approving financial and business performance, and formulating matters like the overall strategies and policies of the Company. 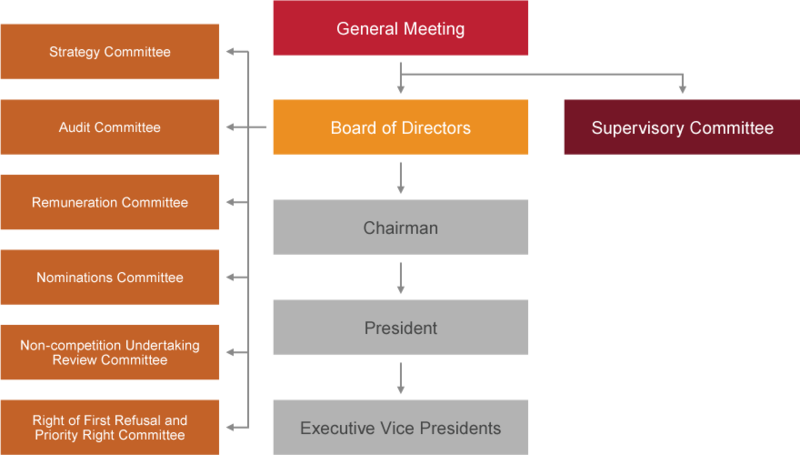 The board is composed of ten directors, including three executive directors, two non-executive directors and five independent non-executive directors. To supervise the overall affairs of the Company in various areas and assist the Board in discharging its responsibilities, the Board has set up five Board Committees. All Board Committees comprise of independent non-executive directors to ensure the full expression of independent and objective views and to fulfill each of its responsibilities of overall safeguard and supervision. The Company has established a Supervisory Committee pursuant to the regulatory requirement of the PRC. The Supervisory Committee is accountable to all of the shareholders. In accordance with law, it exercise its functions of reviewing the financial information, supervising the performance of duties of the directors, managers and other senior management and safeguard the legal rights of the Company and the shareholders. The Company has formulated and implemented the "Code of Ethics for Senior Officers" and the "Code of Ethics for Employees", to further standardize the regulations of conduct of the management and employees and maintain our high standard of business ethics and integrity. Besides, the Company has adopted the Model Code for Securities Transactions by Directors of Listed Issuers as set out in Appendix 10 of the Listing Rules to govern securities transactions by directors. The Board approved the respective articles of association for the five Board Committees, and specified their written terms of reference and charters. The Company formulated and implemented the "Charter for the Supervisory Committee of China Communications Services Corporation Limited", to further standardize the daily operating mechanism for corporate governance and commit itself to maintaining a high standard of business conduct and integrity. The Company is committed to strengthening its internal control and risk management and has established a sound internal control foundation. For details, please refer to Risk Management & Internal Control section. The Company considers that integrity, timeliness, fairness and accuracy in information disclosure is key to improving corporate governance. As such, the Company formulated and implemented the Information Disclosure Management Regulation (Provisional). In accordance with the Company's internal policy on information disclosure and the requirements of Listing Rules, the Company further improved external information publishing, especially in respect of important information such as price sensitive information, information related to annual reports and interim reports, so as to ensure true, accurate, complete and timely information disclosure. At the same time, the Company has set up an investor relations department that is responsible for providing necessary information and services to our shareholders and investors.